There are a fairly large number of foods that are widely considered healthy that just aren’t. Although consuming some of them in small quantities might not be an issue, it’s important to understand that these are not really healthy foods. Peanut butter, unless it’s organic, can contain large amounts of toxins that the growing peanuts pull from the soil. In fact, peanuts are often used as a clean-up crop on soils that have been heavily sprayed with pesticides and fungicides. Reduced-fat peanut butter is also a problem, as the extracted fats are usually replaced by sugar and salt. For a healthy version of peanut butter, choose organic peanut butter made from whole ground-up peanuts. Read the label and choose one with the fewest ingredients, and avoid preservatives, added sugars, and food colors. Real organic peanut butter will need to be refrigerated if you won’t consume the whole jar within a month, or if you live in a warm climate. Otherwise, the oils in the peanut butter may become rancid. Juices, including fruit and vegetable juices, are generally fine in small quantities but are not ideal to consume in large amounts. Juices can be very high in sugars, and because the fiber has been reduced in the creation of the juice, they are less healthy than creating a smoothie that contains both the juice and pulp of the fruit. Diet sodas have been proven to be linked to obesity, and dieters who replaced regular soda with diet soda tend to gain even more weight. In addition, diet sodas are often laced with questionable chemicals and dyes, and offer no real food nutrition. Substitute water, or organic herbal teas (which can be iced). The challenge here is the amount of sugar. Most fruit flavored yogurts contain 28 g of sugar in a small serving. Instead, choose plain yogurt and add real chopped fruit and/or nuts. It depends on the ingredients, and you should read the label, but many bars are actually glorified candy bars containing far too many sugars and calories. There are certainly a few high-quality bars out there, such as Kind bars, but many are junk foods. Avoid chemical preservatives, sugars, and seed oils. Sounds healthy right? Many people think banana chips are dried, but unfortunately they are deep-fried, usually in unhealthy oils. Because of their high “bad” fat content, these aren’t a healthy snack – they are an invitation to high cholesterol. 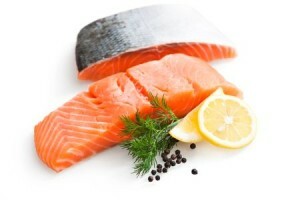 Because farm salmon is fed on a high carbohydrate diet of mostly grain, they are much higher in omega-6 fats than their wild-caught counterparts. Most of us are consuming a diet with poor ratios of omega-6 to omega-3; we need less omega-6 and more omega-3 in our food. While all salmon is an excellent source of omega-3, wild-caught is better for us because we avoid the higher amount of omega-6. Farm-raised salmon contains 980 mg of omega-6 per 100 grams, versus only 170 mg of omega-6 per 100 grams in wild-caught salmon. Most store-bought granola and muesli contains far too much added sugar, and often delivers about 500 cal per serving. Look into making granola at home and you can produce a superior quality and tasty breakfast easily. Dyes, chemicals, and sugar. What more needs to be said? Drink water, mineral water, herbal teas or coconut water, and eat a banana if you need more potassium. If you’re really concerned about restoring electrolytes after a heavy workout, look into healthier sources of electrolytes. Popcorn seems like a healthy snack. It contains lots of fiber and is and isn’t heavy on the calories (unless you slather on the butter too thickly). However, microwave popcorn contains a chemical called diacetyl which is added to almost all artificial butters. While it’s safe to eat, it’s dangerous to inhale. When you smell that microwave popcorn cooking, you are potentially inhaling diacetyl. In addition, the linings of some microwave popcorn bags often contain chemicals such as PFOA, which are obeseogens and may be linked to infertility, liver cancer, testicular cancer and pancreatic cancer. Store-bought dried fruit often contains added sugar, as well as sulfur to prevent browning of the fruit. If you can’t dry your own fruit at home, try to purchase organic dried fruits with no sulfur or sugar added. It’s certainly possible to find healthy foods out there, but it’s important not to make assumptions. Read the food labels, not just the marketing promotions on the front of the package that may say things like “healthy” or “natural.” Unfortunately those statements don’t mean anything, and they won’t help you identify healthy snacks or foods. I hope this list of healthy foods that aren’t always so healthy has educated you on a few foods that are less healthy/safe than you may have assumed.